So as you might have all heard from us over the past couple of months that we have been very busy updating the app for Android. We realise it has taken us longer than expected but we are happy to announce it has finally launched for you all to check out. So we wanted to do a quick overview of what to expect on this version of the Android update. This was a huge request for many users via FB messages and reviews, and finally, you will be able to transfer your data from Android to iPhone, iPhone to Android and Android to Android. This was always going to be the first feature we wanted to add to the new update and was the main reason why the update was so delayed since we hit some minor issues with our server space. You can now choose from a vast collection of image packs for this update and you can also unlock single images from packs by simply watching a video ad via the app. We will be aiming to update image packs a lot more frequently from now on as well. This was also a big request that we actually fix the Facebook button, and since the last couple of years Facebook has made things a little more difficult so you will need to enable events from your laptop first then you will see Facebook Events show in the app. We will create a video tutorial to better explain the process and we have added a pop up in the app to better explain the process. For this update, you can now share too much more platforms than before. 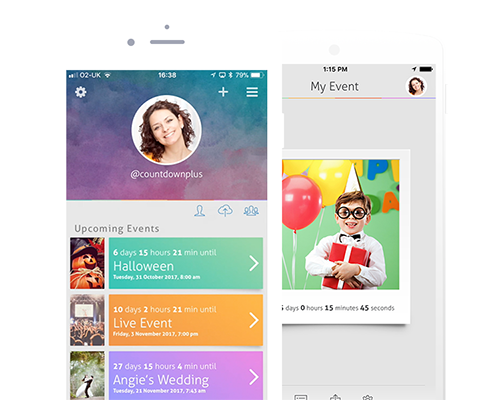 Share any screen and countdown to Facebook, Twitter, Instagram and many other platforms. In the next few weeks expect to see a whole heap of video tutorials on all channels on social. So follow us on Twitter, Facebook and Instagram to find all the videos.